Nothing is more celebrated in Canada than the arrival of summer... unofficially known as backyard barbecue party season. But how do you make sure your summer gathering extends from afternoon past sunset? Four friends enjoying a day at the pool. The Aussies have longer summers than we do, and that extra practice means they've mastered the laid back summer backyard gathering. In Aussie-speak, these casual afternoon barbecues are called "sessions." The essential ingredients of a "session" are similar to any other summer gathering. You need lovely people, good food, great wine and the right music. 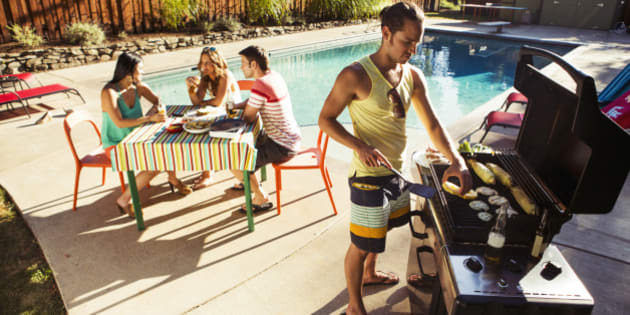 Here are six tips to host your own Aussie-style session this summer! 1. Keep the menu simple. Aussie sessions are known for cuisine such as meat pies, sausage rolls and ribs. You can go all out and splurge on calories or make some healthier options to balance things out and give your guests choices. Nothing's as Aussie as throwing shrimp on the barbie. 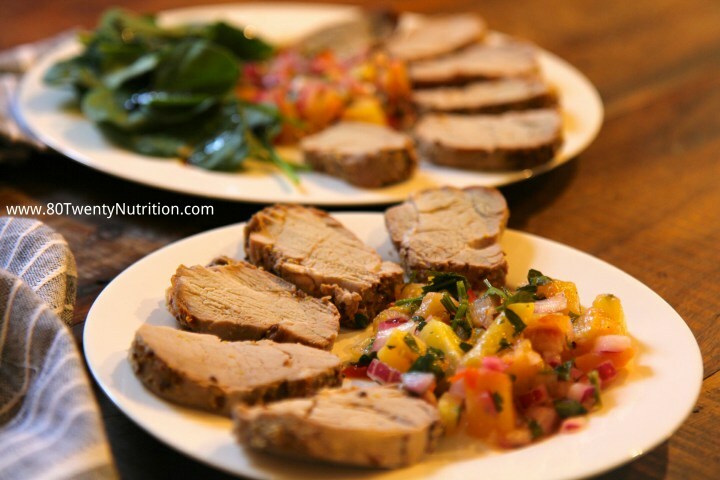 Another delicious lean protein: get some pork tenderloin ready to grill and pair with some summery pineapple salsa. Try my crowd-pleasing grilled pork tenderloin and pineapple salsa recipe! 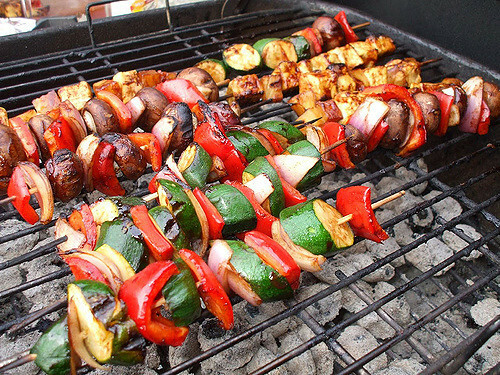 For a healthier barbecue, grill up plenty of vegetables such as bell peppers, zucchini, eggplant, tomatoes and portobello mushrooms. Serve on a large platter. The bright colours will look amazing and encourage everyone to pile up on veggies. Another delicious addition to your grill: halloumi cheese! Grill it in strips or put on skewers alternating with veggies. Photo credit: Lost in the Red Woods via Flickr). Looking for healthier dessert options? Try grilling fruit such as peaches or mango. Sprinkle with cinnamon and you'll have a mouth-watering dessert your guests can feel good about! Paint rocks or stones found at any beach or park with descriptions of the tucker you'll be serving. (Aussie to Canadian Translation: tucker = food). A fun DIY decor idea that will only cost you a few dollars and a trip to your dollar store or gardening centre: use terra cotta pots or other flower pots or planters as ice buckets for your wine. How fun is that? Make sure you choose Australian wine such as Mallee Rock Shiraz Cabernet Sauvignon 2014 or Mallee Rock Pinot Grigio 2015 to stay on theme. These new Aussie wines are available across Canada. Pick up pallet crates from any home improvement store and paint to fit the theme of your summer session. Add some simple pillows for a pop of colour. 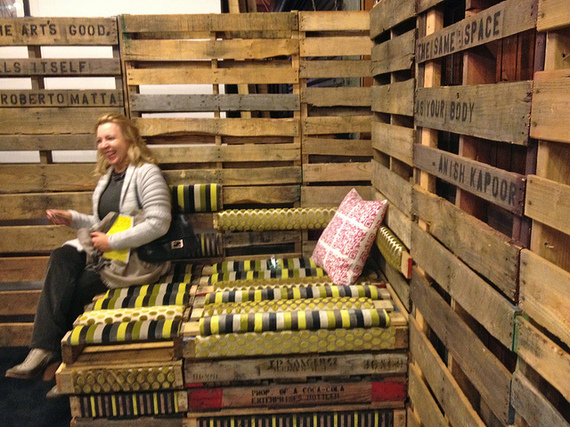 Create a bar with two crates, one for the front and one cut into two pieces for the sides. Fasten sides to the front securely and add a piece of plywood to the top to create a bar. (Photo credit: Lynn Friedman via Flickr). 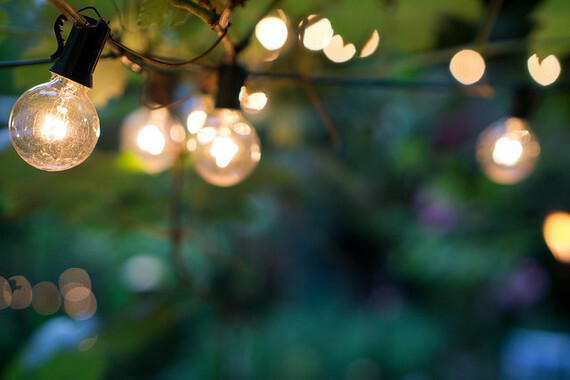 Simple and inexpensive, outdoor lights strung across your backyard or balcony make for the perfect summer session. You might be starting your session in the arvo (Aussie slang for afternoon), but once the sun sets you'll need a little bit of light to keep your session going. Photo credit: Kzoop via Flickr. Looking for some upbeat tunes that are decidedly Australian? Give your session a fun, upbeat vibe with classic music from The Bee Gees, Men at Work and INXS mixed with tunes from newer rock bands like Nick Cave and The Bad Seeds, Wolfmother and Tame Impala. Wishing you a fun-filled Aussie-style summer session! Disclosure: This article was supported by Mallee Rock Wines. DIY Decor Tips were provided by Cahoots Creative Happenings. All opinions are 100 per cent my own.